Stevens, Robert “Bobby” George, 68, of Liverpool, passed away surrounded by family on Saturday, March 24th, 2012, in the Queens General Hospital, Liverpool. Born in Pictou, he was a son of Doris (Weaver) Stevens, of Liverpool and the late Fred Stevens. Bobby was a fun loving free spirit. He loved spending time with his family and friends, especially outdoors enjoying a good BBQ. He spent most of his working years cooking and painting, both of which he enjoyed. Bobby loved the energy and joyfulness of the young and young at heart. He made many fond memories with friends and loved ones over the years. 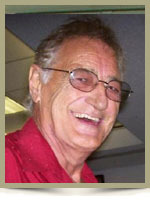 He is survived by his soul mate Esther Legge; daughters Colleen Stevens, of Napadogan, N.B., Deborah Stevens, of Fredericton; son Brian (Lynn) Stevens, of Fredericton; grandchildren Michael, Hannah, Rebekah, Sarah; brothers Arnold (Carol) Weaver, of Queensland, Aubrey (Marie) Hansen, of Ontario, Donald (Elaine) Stevens, of Hubbards; and nephew Shawn of Fredericton, along with many other nephews and nieces. He will be greatly missed by everyone. He was predeceased by a sister Charlene and a brother Gordon. To my Stevens| Family i send the deepest of condolences . I have know Bob for over 47 years now, We were once married and have children and grandchildren together , During the time he was ill he would call and talk to me about what he was going through . I spent the time telling him it was ok to be scared of that cancer but to fight it too the end which he did , He will be missed by his kids grand kids and myself . i am sorry you left so soon Bob you were loved . I did not know Bobby but I want to send my condolences to you.. My thoughts and prayers are with you at this most difficult time. ESTHER & FAMILY SO SORRY FOR YOUR LOSS .THINKING OF YOU ,GOD BLESS. To my dear Aunt Esther and the family of the late Bobby Stevens, I never got to meet any of Bobby’s family but I know that the short time I have known Bobby he became a part of our family. I know my Mom (Beatrice) loved him like a brother, he will be sadly missed by all who knew him. I am so sorry for your loss, Aunt Esther, you have gone through so much over the last 10 years or more. I pray that God will comfort you all during your loss and may He bless you all with the memories of Bobby. I won’t be able to be there for the service but please remember that you all will be in my prayers and heart during this time of grievance and in the days ahead. Take care AUnt Esther, and I send you a huge hug along with God’s arms surrounding you too. Dear Colleen, Our sincere sympathy. my thoughts are with you all. paul mc guire i love you colleen!! My heart goes out to Bobbys family…the memories will be forever in your heart. My condolences to the family especially Colleen, Debby and Michael. Glad some of you were there with him at the end. Sorry to hear of Bobby’s passing. He fought a long hard battle. My sincere condolences. To my Grandmother – Nan, Dad is at peace now & although we all miss him dearly he will never be forgotten. To Esther – Dad will live in your heart forever. To my mother – Mom .. I wish you would have been with us at the service yet I think it would have been to much for you. To my Brothers & Sisters – Dad is always going to be with us no matter what. I love you Dad & you are always with me. And to my cousin Trish … you are a amazing woman & you did a wonderful job on the service. Dad would have been proud! !